Are you looking for the perfect gift to give passionate stamper in your life? How about a Gift Certificate that can be used to purchase Stampin Up products? See more details below! NOTE: These gift certificates cannot be used for online orders. In order to take advantage of these gift certificates, you must either call Brandy or email Brandy your order. Once Brandy receives your order, she will email you back to confirm your order. If there is any overage she will forward you a paypal invoice in which you can pay via paypal or I can make arrangements to call for a visa, mastercard or discover. 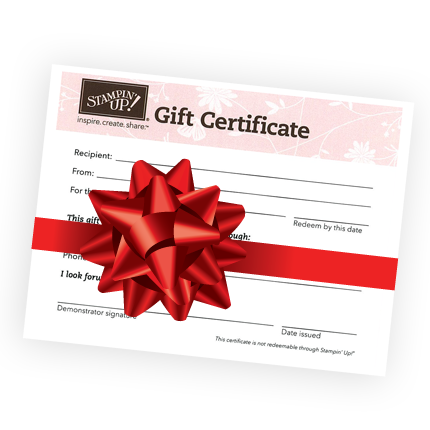 Please know that these Gift Certificates purchased from Brandy’s Cards are only redeemable through Brandy’s Cards. Not all demonstrators offer gift certificates. If the certificate is purchased from Brandy’s Cards then Brandy’s Cards is holding the funds waiting for the order that will coincide with it.